A participant is asking questions to presidential candidates. 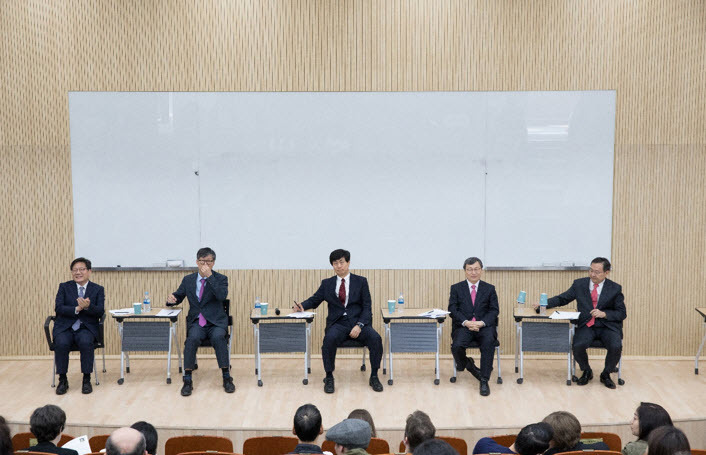 On April 27, the International Faculty Association (IFA) held an open discussion forum with the five SNU presidential candidates. The subject of the forum was the “Internationalization of SNU” and all members of the SNU community were invited to participate. Selected from an original list of ten, the five candidates running to become the 27th president of Seoul National University are (in alphabetical order): Jung Keun-sik (Professor of the Department of Sociology), Kang Dae-hee (Professor of the Department of Preventive Medicine), Lee Kunwoo (Professor of the Department of Mechanical Engineering), Lee Woo Il (Professor of the Department of Mechanical and Aerospace Engineering), and Nam Ick-Hyun (Professor of College of Business Administration). Presidential candidates: (from left) Kang Dae-hee, Nam Ick-Hyun, Lee Woo Il, Jung Keun-sik, and Lee Kunwoo. Prompted by moderator David Wright (Professor of Archaeology and Art History), each candidate gave a five-minute opening statement discussing their visions for fostering diversity at SNU. Following their statements, the candidates answered questions from the audience and interacted with attendees. 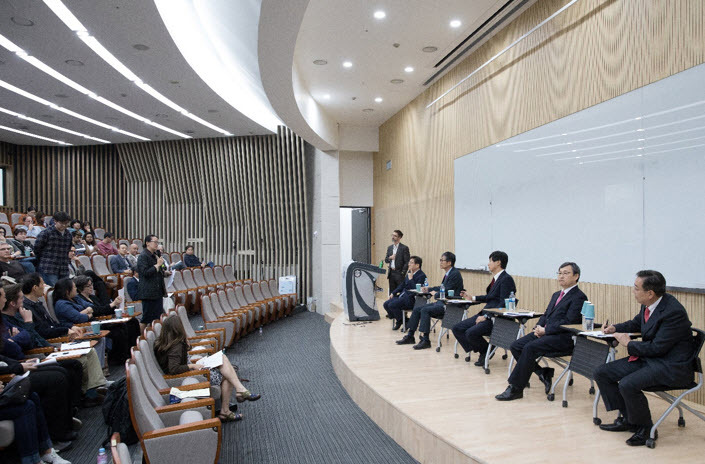 The event marked the first time in SNU history that an open forum discussion for presidential candidates was held in English. Professor Charles La Shure (Department Korean Language and Literature) was on hand to facilitate translation. The candidates proposed solutions to important issues faced by the international community of SNU including housing, healthcare, opportunities for promotion, student internship opportunities as well as language and cultural barriers. Other issues discussed were: means of improving benefits for international faculty members, especially in support for housing and education costs for SNU families; facilitating better communication between the administration and staff; maintaining up-to date English versions of all rules and regulations; and increasing both the quality and quantity of courses conducted in English. For the first time in the 72-year history of the SNU presidential election, not only professors and staff but also undergraduate and graduate students will be able participate in the presidential candidate policy evaluation board that will take place on Thursday, May 10. 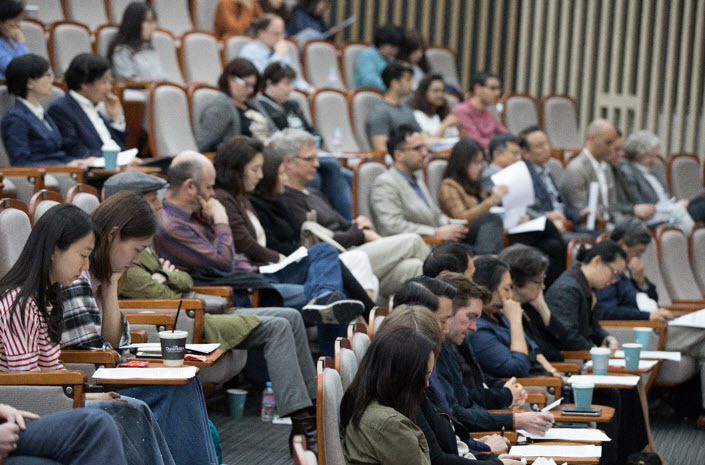 Students interested in attending the policy evaluation meeting, at the end of which voting will take place, can sign up at: http://my.snu.ac.kr/mysnu/.